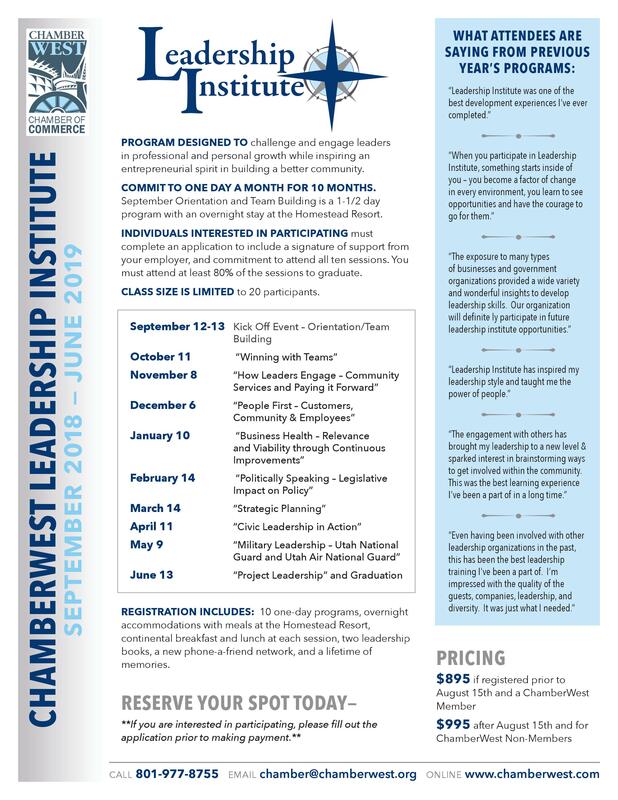 The Leadership Institute Program is designed to challenge and engage leaders in professional and personal growth while inspiring an entrepreneurial spirit in building a better community. Participants register in July/August prior to the start of the 10 month program. There is a required commitment to participating in the program for one day a month for 10 months. The first month also includes an evening program with meals and overnight accommodations at the Homestead Resort in Midway, Utah. "Leadership Institute has inspired my leadership style and taught me the power of people." "It is richly rewarding to be able to get inside of prominent businesses, government, and other community organization to learn leadership principles and techniques." "When you participate in Leadership Institute, something starts inside of you - you become a factor of change in every environment, you learn to see opportunities and you have the courage to go for them." "Participating in Leadership Institute has helped me break free from insecurities, weaknesses, and will ultimately help me grow and develop into a stronger and more confident person!" "The engagement with others has brought my leadership to a new level & sparked interest in brainstorming ways to get involved with the community. This was the best learning experience I've been apart of in a long time." "Even though I've been involved with other leadership organizations in the past, this has been the best leadership training I've been a part of. I'm impressed with the quality of the guests, companies, leadership, and diversity and it was just what I needed." Registration Includes: 10 one day programs, overnight accommodations with meals at the Homestead Resort, continental breakfast and lunch at each session, two leadership books, journal, new phone-a-friend network, and a lifetime of memories. Board of Trustees is responsible for creating and executing the curriculum and program.